So I recently tried nutritional yeast for the first time. I think its really great actually. During my several 40+ mile weeks of peak marathon training, my staple snack was a slice of whole grain toast with Earth Balance spread and sprinkled with nutritional yeast. Quite nice. I can see how people who are die-hard devotees to the S.A.D (Standard American Diet) would find it weird though. 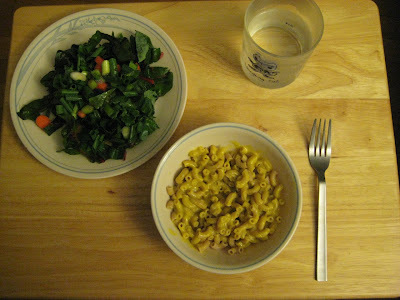 I found a couple of recipes online for vegan macaroni and cheese using nutritional yeast, and I thought I would try it. Now, I’ve never been a fan of the traditional box made macaroni and cheese. I’m sure I’ve eaten it at some point in my life, but probably not for at least 12 or 15 years. Rob has a distinct aversion to macaroni and cheese because when he was 5 years old, there was an unfortunate vomiting incident that occurred immediately after he had eaten a meal of macaroni and cheese with red Kool-Aid. What has always puzzled me about this is that although Rob cites this incident as why he refuses to eat macaroni and cheese, he has no such aversion to red Kool-Aid. Here are some photos of the meal. 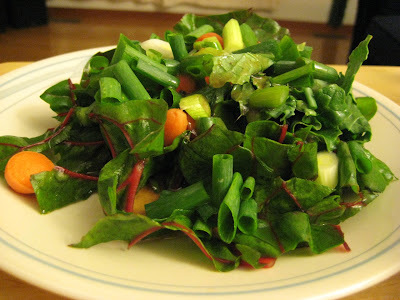 For good measure, I also made a nice swiss chard salad. And another photo of the salad, just because it was so lovely. What a beautiful dinner ... it should be in a magazine!! Your salad looks so good, i almost took a bite out of the computer!!!!!!!! Hoping your race day is better weather than today -- this wind would blow you all the way to Kansas ... even Katie doesn't want to go out!! 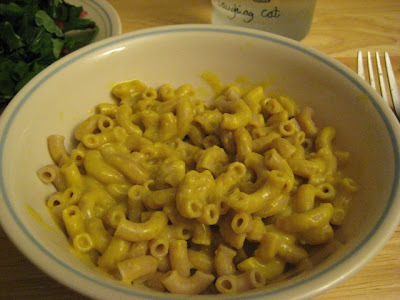 Last night, Logan refused the traditional box variety mac and cheese dinner, so maybe we should try Auntie M's variety. It looked yummy and worth a try. If Vegan Mac and Cheese are as good as Vegan Brownies, then I'm all for it. Auntie-- I don't know if you recognize them, but those are your old Correll dishes that you gave to us! Thanks, its all we've been using for the last 7+ years! Momma-- there are a lot of people who have vegan cooking shows or websites, and they can do it a lot better than me! I think I need more practice before trying it myself. Michelle-- sorry Logan was being a fussy eater. maybe he was holding out for brownies :) I think that the vegan mac and cheese would be okay for little kids, but I might have read somewhere that really little kids shouldn't eat too much nutritional yeast... I guess its so packed with vitamins that they might get too much of a good thing. I don't really know... its not something that I have looked into very much!